SeatAdvisor is a software company that provides event management, venue management, and ticket management solutions for event organizers and venue managers. SeatAdvisor is a platform that combines ticketing, marketing, sales analytics, and customer relation management to give the organizers full control over the event for the seamless organization of the events. Not only organizers, the solutions also facilitate the patrons with best possible user experience through features such as seat mapping, online ticketing, and ‘view from the seat’. 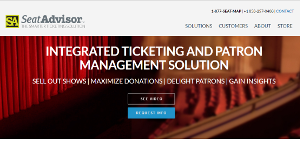 Over 500 event organizers including festivals, hotels, schools, universities, racing events, sports events, and performing arts events use SeatAdvisor’s ticketing system to sell tickets and manage patrons. Annually, millions of tickets are sold through Box Office Ticketing and Online Ticketing; Seatadvisor’s two main solutions. SeatAdvisor helps the event organizers grow their audience and increase their sales by providing their customers with the top-quality user experience. The web-based ticketing system allows the users to purchase tickets from anywhere using the internet enabled device. The integrated point of sales system of SeatAdvisor means that ticket buyers have no difficulty in buying tickets regardless of the geographical location. Moreover, the mobile friendly interface provides the ease and accessibility to the customers. Features such as the view from the seat provide a unique experience for the customers. With the help of this features, a ticket buyer can virtually experience the view of the venue from his seat. This way, a customer can select a seat of his choice according to his preferences. SeatAdvisor offers more such features that can be customized according to the event and the venue. From an even organizer’s point of view, SeatAdvisor’s ticketing and event management solutions provide a perfect event experience with all the necessary tools that provide real-time marketing and sales analytics. Organizers can easily integrate SeatAdvisors with their websites through SeatAdvisor’s open API. Moreover, they can also integrate the SeatAdvisor products with their social media channels for better marketing and reach. Apart from the software solutions, SeatAdvisor also produces hardware that is used in the event management such as barcode scanners and ticket generators. If you are interested in SeatAdvisor it may also be beneficial to check out other subcategories of Best Event Management Software gathered in our database of B2B software reviews. Each enterprise has different wants and requires a system that can be customized for their size, type of staff members and clients, and the specific industry they are in. For these reasons, no system can offer perfect features out-of-the-box. When you try to find a software system, first be sure what you require it for. Read some SeatAdvisor reviews and ask yourself do you desire basic tools or do you want complex functionality? Are there any industry-specific tools that you are seeking? Obtain the answers to these queries to aid your search. There are multiple factors that you need to mull over and these include your budget, specific business needs, your company size, integration needs etc. Take your time, try out a few free trials, and finally select the app that offers all that you need to enhance your organization competence and productivity. How Much Does SeatAdvisor Cost? SeatAdvisor’s SMB and enterprise pricing information is available only upon request. Contact the company for more details, and ask for your quote. We realize that when you make a decision to buy Event Management Software it’s important not only to see how experts evaluate it in their reviews, but also to find out if the real people and companies that buy it are actually satisfied with the product. That’s why we’ve created our behavior-based Customer Satisfaction Algorithm™ that gathers customer reviews, comments and SeatAdvisor reviews across a wide range of social media sites. The data is then presented in an easy to digest form showing how many people had positive and negative experience with SeatAdvisor. With that information at hand you should be equipped to make an informed buying decision that you won’t regret. What are SeatAdvisor pricing details? What integrations are available for SeatAdvisor?